Ian Richardson, Partnership Director, Andrea Sturgess, Council Head of Communications and Engagement, Ilyas Munshi, EG Group Commercial Director, Sarah Lucas, EG Acquisition Manager, Council Chief Executive Harry Catherall, Zuber Issa, EG Co-CEO and Founder, Council leader, Councillor Mohammed Khan and Emily Robinson, Planning Consultant, PWA Planning. 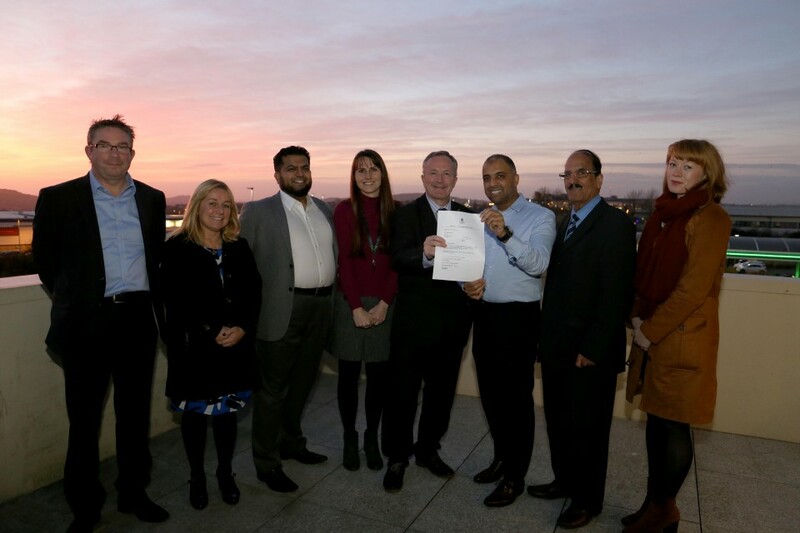 Council leader, Councillor Mohammed Khan and Council Chief Executive Harry Catherall met with the company leadership to confirm the planning permission and further discuss the development which is set to create up to 150 new jobs. The EG Group is one Europe’s leading petrol forecourt and convenience retailers. The company was ranked sixth in the Sunday Times HSBC Top Track 100 league table of Britain’s 100 private companies with the biggest sales and was the highest-ranked in the North West. The company added £3bn in sales last year to £3.8bn, primarily as a result of its merger with European Forecourt Retail (EFR) last year to form EG Group with circa 1,450 locations across France, The Netherlands, Belgium and Luxembourg. In June this year, the group agreed to acquire another 1,176 service stations in Italy. The acquisition in Italy represents the latest significant petrol forecourt asset acquisition by EG Group in line with its strategy to be Europe’s leading independent forecourt retailer. EG Group continues to review all strategic options to maximise value for shareholders and may include a potential initial public offering (IPO) consideration in the near future. The new three storey office development is expected to be complete in summer 2018. It will be a water front location close to Fishmoor Reservoir. The construction build and fit-out style will be in keeping with the area. The current EG Group offices on Haslingden Road will then be used as a training and development centre. Furthermore, management are considering options for two drive-through restaurants are being explored as part of the proposed development. Planning permission has been granted, the brand and type of restaurant is still to be agreed. Road improvement works are a condition of the planning permission so as to avoid any traffic problems.